The Sitatunga Worksheet – Download the FREE printable easy science for kids worksheet. Our free science for kids worksheet is ideal for children in preschool through fifth Grade. This worksheet about the the Sitatunga animal is downloadable and printable. Use the easy science for kids worksheet about Sitatunga for fun after-school activity with your kids. Our free to print and use science kids worksheets are great for elementary school kids, grammar school kids, preschool kids, Kindergarten kids and even for Pre-K kids. Younger children who cannot yet read & write will enjoy this printable Sitatunga worksheet as a listening comprehension activity. Elder kids will not only enjoy the missing words game and the find-the-hidden-words puzzle this Sitatunga worksheet (and many of our other free worksheets) offers, but also can use it as a reading comprehension worksheet. 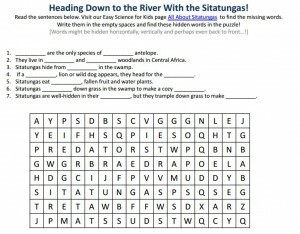 This search a word puzzle on Sitatunga is a great way for kids to enjoy learning fun facts about Sitatunga. This online hidden and missing word puzzle on Sitatungas is fun and an easy way to get your child’s attention during homeschooling or science enrichment classes. This free printable easy science worksheet for kids about the wild Sitatunga animal, teaches fun facts about the Sitatunga diet, types of Sitatunga birds and other fun facts about Sitatunga animals, to better understand the nature of these african wild animals. Our science made easy for kids website offers many more free printable worksheets for kids. Sitatunga animals belong to the cattle family. The Sitatunga is the only aquatic antelope, because its hooves are design to walk through water. They are wild animals from Africa and the Sitatunga diet consist of grass, fruits and water plants. Download the FREE Sitatunga worksheet to learn more fun facts about Sitatunga! [sociallocker]Download printable easy science worksheet about the Sitatunga. Download the FREE Sitatunga Worksheet! Did you enjoy the FREE Sitatunga Worksheet? Read lengthy info about Sitatunga animals here. Declan, Tobin. " The Sitatunga Worksheet - Free Printable Easy Science for Kids Worksheet - ." Easy Science for Kids, Apr 2019. Web. 26 Apr 2019. < https://easyscienceforkids.com/the-sitatunga-worksheet-free-printable-easy-science-for-kids-worksheet/ >.